"Villa l'Alta is a lovely modern villa with breathtaking views over The Valinco. To wake up in the morning and see those views from your bed is quite something." The south-west coast remains the least developed part of Corsica and, in the absence of mass tourism, an example of island life at its most authentic. The Valinco lies between the headlands of Capo di Muru and Campomoro’s sweep of perfect sand. Between the two, on the coast, lies chic Propriano, an evolution of a traditional town into a relaxed resort with boat trips and watersports. In the north is cosmopolitan Ajaccio, the island’s capital; in the south, Sartène, ‘the most Corsican of Corsica’s towns’, and a place to linger, over a plate of local charcuterie and glass of excellent Sartènais wine. Corsica’s visible human history begins with the stone menhirs at Filitosa, dating from 6000BC and proud testaments to one of the oldest settlements in Europe. Years later, the Greeks, Carthaginians and Romans followed and the Genoese also made their mark with the watchtowers built as a first line of defence against pirates. It was these unwelcome visitors who also prompted communities to seek the relative security of the hills inland. There, ramshackle collections of imposing fortress-style town houses hint at a past rich with conflict and a passionate people whose independence is paramount. Historic Sartène is a prime example of this fierce island patriotism. The soft sand and azure waters of Valinco’s many beaches are reminiscent of the Caribbean islands, but the coastline’s pared-back wildness is equally akin to Cornwall’s rugged charm. The occasional flash of a passing yacht is offset against crumbling lighthouses and beacons rising out of the grassy headlands along the coast. A windier clime adds to the drama and makes Valinco’s bays an ideal choice for anyone wanting to try their hand at watersports, although there are also plenty of sheltered bays and coves, for less advanced swimmers to enjoy a dip in calm waters. For those who love to venture below the waves, Porto-Pollo is known as the region’s best for underwater experiences. Ajaccio, Corsica’s elegantly vibrant capital, is synonymous with Napoléon who was born there in 1769. His birthday is still proudly celebrated every year on 15 August with parades and fireworks; Maison Bonaparte (the family home) continues to draw the crowds and there’s a museum in his honour in the Hôtel de Ville. However, for those less interested in emperors, an exploration of the town may lead you to the 16th-century cathedral, ancient citadel or the lovely Old Town. Distraction also lies in the many cafés, restaurants, brasseries and boutiques – and a leisurely walk along the chic waterfront or yacht watching around the marina ensures the holiday spirit continues in style. The island’s cuisine is defined by the maquis, the dense shrubland covering its rugged interior, which provides rich pastures for snuffling wild boar and rich pickings to fill the larder. Chestnut features strongly in recipes. The fruit of the trees is simmered in stews and made into unctuous sweet spreads and preserves, the smoky, nutty flavour of chestnut flour enhances everything from bread to beer and there’s also a Corsican version of polenta. You’ll find this in the traditional auberge restaurants, a unique blend of French and Italian influences. And even the humble pizza becomes something special when it’s baked crisp in a smoky oven and served with a carafe of ice-cold rosé – look out for signs saying pizzas au feu de bois. There are weekly food markets in most towns and smaller local supermarkets often have aisles dedicated to homemade produce. The wines are world famous, but there are alternatives. Corsica also brews some unusual craft beers, made from malt and chestnut flour and pastis is the universal apéritif, but don’t leave without trying Cap Corse, a uniquely Corsican fortified wine, and myrte: eau de vie macerated with myrtle berries from the maquis. 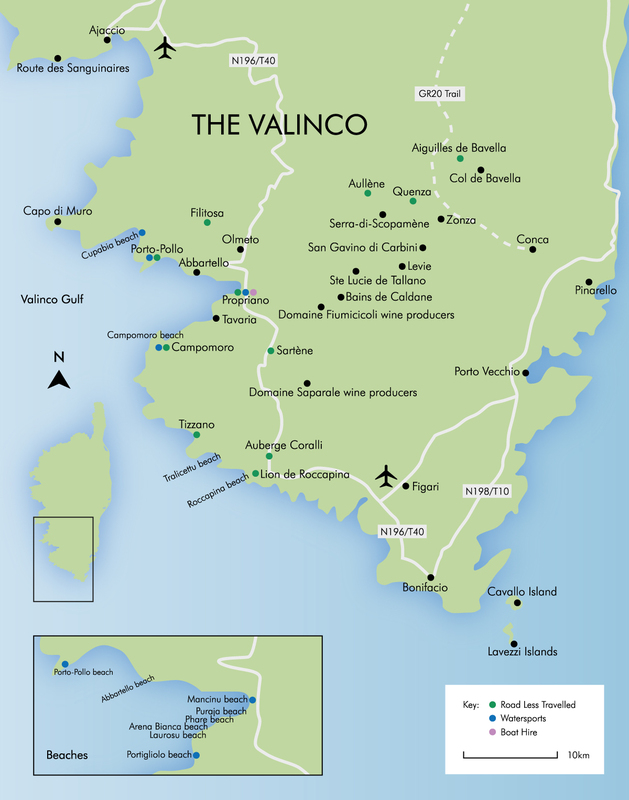 Valinco is home to some of the most authentic ferme auberges – rustic inns – on the island, where hearty, seasonal dishes are served at a leisurely pace in the rural towns and villages scattered throughout the region. For the widest selection of restaurants try Avenue Napoléon III in Propriano or, for a waterfront meal, head to the harbour or to the smaller resorts of Porto-Pollo, Abbartello or Campomoro. The ancient Corsican town of Sartène is home to two of Corsica’s most famous wineries, where daily tasting sessions take place among wonderfully scenic views of the surrounding hilltops. Visitors to one of the best producers, Domaine Saparale, are encouraged to call ahead, while Domaine Fiumicicoli, on the road towards Ste Lucie de Tallano, just after Spinalonga Bridge, is open for passing visitors pre-noon and late afternoon. Produce from both can also be enjoyed in the region’s restaurants. A crescent of golden sand overlooks shallow waters perfect for a family day at the beach. Accessed via the road leading out of Propriano towards Corsica’s capital city, Ajaccio. Parking is free. Home to Valinco’s Centre Nautique, which offers lessons and equipment hire for sailing, kayaking and stand-up paddle boarding. One of the region’s largest, this 4km stretch of beautiful sandy beach lies in two parts, either side of the Rizzanese River. The next stretch of coastline along from Arena Bianca. The beach is generally quiet and there are no facilities other than parking. A simply stunning, unspoilt beach overlooking shallow turquoise water and presided over by a huge rock shaped like a lion basking in the sun. Accessed via a dirt road; car parking is available. The lack of facilities are part of Roccapina’s charm; bring a picnic, especially if you intend to take a short hike up to the proud lion on high. A long stretch of coastline featuring beaches in every shape and size – from long and sandy to smaller, more secluded, sheltered coves. Drive along the D157 near Abbartello until you find your spot of choice. Waterside cafés, restaurants and hotels along this stretch provide a good variety of dining options. This perfect crescent of white sand sloping gently into the sea is excellent for children. There’s a scuba diving school, horse riding and plenty of rock pools worth exploring. You’ll find this beach at the end of the long, winding road from Propriano. Take a breezy walk to the picturesque Genoese watchtower on the headland. In the Gulf of Valinco, this large, popular sandy bay is good for windsurfing and a starting point for hiking into the National Park. Follow the winding coastal road in the direction of Porto-Pollo and onwards towards Serra-di-Ferro and the Coti Chiavari. Parking is scarce so early starts are best during busier months. Don’t be surprised to find yourself sharing the fine golden sand with the resident cows. With cobbled streets lined with pavement cafés, boutiques and charming restaurants, Propriano is a place for soaking up an abundance of holiday atmosphere – and the harbour is a great place to while away a few hours watching yachts come and go. In the magnificently mountainous Alta Rocca region, a short drive inland, scenic Col de Bavella is a hub for hiking, rock climbing, canyoning, horse riding and quad biking. Cool off in the rock pools below Zonza, before dining in a traditional auberge. Surrounded by pine forests and impressive mountain scenery, time spent exploring the local villages is never wasted. Quenza, Aullène, Serra-di-Scopamène, Levie, Zonza, San Gavino di Carbini and Ste Lucie de Tallano are all worth a visit. Catamarans, sea kayaks and windsurfing boards can all be hired from schools along the coast, while the Gulf itself – Le Grand Bleu – is popular with scuba divers with organised excursions available in Campomoro, Propriano and Porto-Pollo. To Valinco’s north, in the soft folds of the Taravo Valley, lies Filitosa, one of Europe’s most important prehistoric sites and an 8,000-year-old must-see. It’s most atmospheric as the setting sun casts a magnificent glow over the ancient menhirs. Boat trips are a great way to appreciate the Valinco Gulf. Yachts and catamarans can be hired on the day from Propriano harbour – with or without crew (you’ll need a licence for larger powered boats). Pack a picnic and snorkel. Surrounded by vineyards, Sartène’s hillside granite houses and narrow alleyways have witnessed a tumultuous history. It’s an atmospheric place without the elegant polish of the seaside resorts, but it reflects how traditional rural life once was. Implicated in the violent vendettas that feature prominently in Corsican history and a target for pirate raids in the 17th century, today, picturesque Olmeto is a charmingly ramshackle village of granite houses, cobbled streets and cafés with wonderful views across Propriano. ‘The toughest walking route in Europe’, the GR20, passing through Valinco. You can pick it up in the Alta Rocca and follow the trail out towards the sea, passing rivers, forests, ancient churches and the fragrant maquis en route. Carnaval de la Corse, Sartène. Street parades, a masked ball and live performances. Foire Artisanale de Piana, celebrates local gastronomic specialities and traditional crafts. Bastille Day, public holiday. Fireworks at Propriano port and in Sartène (13 July in Olmeto). A nationwide celebration to commemorate the French Revolution and the end of the ‘Ancien Régime’ with various parades, night time animations and firework displays. Foire de Filitosa, a craft and agricultural fair showcasing artisan food and wines. Foire de Baracci, Thermes de Baracci, Olmeto. Country fair with local produce. Napoléon Festival, Ajaccio. Parades in period costume and festivities celebrate the birth of Corsica’s most famous historical figure. Corsica Classic sailing race, beginning in Calvi and ending at Bonifacio. Festival of Saint-Côme and Saint-Damien, Sartène. Mass and procession. The tiny seaside village of Tizzano is about a six-hour walk along the scenic coastal path south of Campomoro and has two beautiful beaches. The route takes in some impressive watchtowers and secluded bays (only accessible by boat). You’ll also find the largest gathering of prehistoric monoliths in the area, minus the crowds of the more famous ones around Filitosa and Quenza. North of Quenza, beyond the mountain village of Aullène, lies the Plateau de Coscione or U Pianu (The Tableland) in Corsican. These open grazing plains lie at the end of a long, winding ascent along a quiet road and offer spectacular views across the whole region, including the ragged teeth of the Aiguilles de Bavella. There are stables near the peak so you can explore on horseback too. Drive south through Sartène, towards Bonifacio and, on the coast, you’ll see Auberge Coralli to your right and a car park where you can stop and admire the Lion de Roccapina, a rock formation that looks like a lion lying down, looking out to sea, with a crown on its head. Stop off in Sartène on the way back for an apéritif in the square. A 30-minute drive into the mountains, the village of Aullène is a gathering of 16th-century granite houses, their window boxes full of flowers. Its many chestnut trees once provided an income and shepherds stayed here. Now it’s a great place to stroll and stop off in one of the restaurants or cafés. Pop into the Church of San Nicolao to see the intriguing 17th-century pulpit decorated with dragons. For beaches, history and eateries all on one coastal road, take your time over the half-hour drive from Propriano to Porto-Pollo, a pretty fishing village. You’ll pass the beaches of Calanca, Crique and Abbartello, as well as quieter, unlisted bays that only the locals know about.